The last day of the state visit by Trudeau to the Atlantic coast of the United States had a somber note to it, as Nancy Davis Reagan was laid to rest on the west coast. At the same time, both occasions remind us of the importance and enduring nature of the relationship between these two great nations. Mulroney's moving narrative of the close and personal friendship that grew between the two Irish lads who married above their station, was honest and uplifting, as tears caressed his cheeks. While, Trudeau honored Canadians as well as his American neighbors with forthright answers to some disquieting questions about similarities between his recent opponent and rather strident undercurrents of opinions in the present presidential election cycle in the USA. 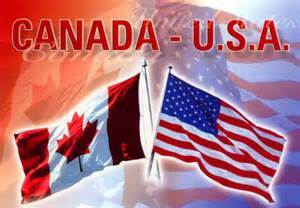 Thirty six-years of Canadian/American relations played out on this day. 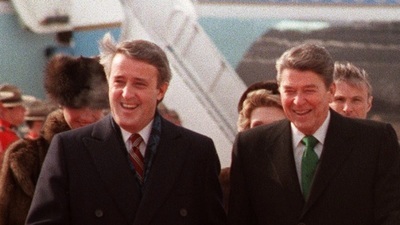 And, in the hope that Trudeau has brought to renewed and shared hope for future relations, and Mulroney's reminder of the past, the nature of a relationship that ought to stand as a model for the rest of the world could be seen and shared by all. 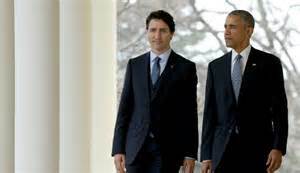 It is difficult to image two better representatives of Canada that could grace America on the same day.